Saints went down by a single goal at White Hart Lane, bringing their five game winning streak to a screeching halt, but Mané really should have equalised in the 83rd minute, when all he had to do was tap in a peach of a cross from Bertrand on the left wing. Instead he seemingly missed what was an absolute sitter. There was not much to choose between the sides, but in truth Spurs always looked slightly better on the break and after their difficult start to the season, were unexpectedly playing the sort of crisp passing, pressing football that we saw on so many occasions at St.Mary's last season. Before the match I was desperate for Saints to win, looking on this as some sort of grudge match. After the match, I was pleased to look at the Premier League table and see that Saints are third going into the International break. Next Saints have two home matches in succession, so things are still looking good. The team was no surprise and Gardos was back on the bench, having got over his slight injury. Spurs meanwhile, had made wholesale changes and brought back several players who were rested for their Europa Cup game in the week. Right from the off there was drama, with Bertrand clearing off the line when the Saints defence were caught a bit flat-footed. Spurs were playing with energy and pressed Saints all over the pitch. It was odd watching Spurs do to Saints what Saints had done to so many opponents last season. After about 15-20 minutes Saints managed to get into the game more and relieve the pressure at the back. There was a real chance at this time, when Mané slid across a wonderful cross from the left touchline, but somehow Schneiderlin and Pellè managed to get in each others way and it was gone. In spite of Spurs pressing game, Saints still had more possession, but seemed unable to work their way through a heavily congested midfield. A tactic that seemed to almost work last week for QPR. This was something that really did not change much throughout the match and Saints had no real answer. Just before the half hour mark Erikson unleashed a fierce shot at goal, but it seemed that although Forster had it covered, it seemed to squirm from his grasp, but fortunately spun beyond the far post. Five minutes later Erikson again had the ball and running across the edge of the penalty area fired into the left of the Saints goal, beyond the despairing dive of Forster. A good goal and this time Forster had no chance of stopping it. Saints looked a bit disheartened by this and until then, had not really put Lloris in the Spurs goal under any sort of meaningful pressure. Spurs were looking much more threatening on the break and Lamela, Erikson and Chadli were causing all sorts of problems with their speed. Chadli even managed to hit the post just before the break. Saints managed to get to half-time without any further disasters and on recent form I was confident that Ronald Koeman would find an answer to the congested midfield and contain the Spurs forwards. There were no changes in personnel for Saints, but straight away Wanyama started to look more effective then the fractious player of the first half that looked a dead cert to get booked. Saints were beginning to get beyond the Spurs back line and shortly after the restart Mané burst through the defence to bear down on goal, when he was unceremoniously upended by Kaboul, who had looked a bit of a donkey up to this point. All he got for this was a yellow and Saints had a free kick, which came to nothing. Not for the first time in the afternoon Forster then spilt the ball, when seemingly under no pressure. He seemed to be having a bit of an off day, but fortunately it had not resulted in anything. 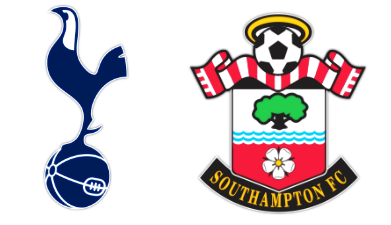 As the game moved from end to end (slowly towards the Spurs goal and then rapidly back towards the Saints goal), Wanyama had the ball at his feet some 25 yards out and unleashed a screamer of a shot, which Lloris did well to get down to. This was just about the big Kenyan's last involvement, as he was replaced in the 76th minute by Shane Long, Koeman seemingly taking the decision to try and take the game by the scruff of the neck. It seemed to work to an extent as Long managed to get more involved around the Spurs defenders, but meanwhile Davis and Schneiderlin were struggling in midfield. Then came a really odd booking, when Tadić was shown a yellow for a fairly innocuous tackle, when far worse had been allowed to pass, notably one appalling tackle and several further niggling fouls by Rose, each one accompanied by a lecture from the referee, Mike Jones. For the last few minutes Saints threw absolutely everything at Spurs and it was in this period that Mané missed a sitter. There had been a wonderful passage of play involving Long and Bertrand, culminating in the full back crossing between the Spurs defence and Lloris. Mané simply had to side foot it in, but somehow contrived to miss entirely. Maybe he did not see it until the last second, but it really did look a dreadful miss. Spurs managed to survive the last few minutes for a satisfying win for the Argentinian manager. His successor as Saints manager was realistic in his expectations (see Ronald Koeman's post match interview below) and as the club is sitting pretty in 3rd place he has a fair point.